A 2016 National Book Award Finalist! Two-time Newbery Medalist Kate DiCamillo returns to her roots with a moving, masterful story of an unforgettable summer friendship. Raymie Clarke has come to realize that everything, absolutely everything, depends on her. And she has a plan. If Raymie can win the Little Miss Central Florida Tire competition, then her father, who left town two days ago with a dental hygienist, will see Raymie's picture in the paper and (maybe) come home. To win, not only does Raymie have to do good deeds and learn how to twirl a baton; she also has to contend with the wispy, frequently fainting Louisiana Elefante, who has a show-business background, and the fiery, stubborn Beverly Tapinski, who’s determined to sabotage the contest. But as the competition approaches, loneliness, loss, and unanswerable questions draw the three girls into an unlikely friendship — and challenge each of them to come to the rescue in unexpected ways. Kate DiCamillo is one of America’s most beloved storytellers. She is the National Ambassador for Young People’s Literature and a two-time Newbery Medalist. Born in Philadelphia, she grew up in Florida and now lives in Minneapolis, where she faithfully writes two pages a day, five days a week. With its short, vibrant chapters and clear, gentle prose, this triumphant and necessary book conjures the enchantments of childhood without shying away from the fraught realities of abandonment, abuse and neglect…Twirling a baton requires flair and confidence, in addition to an understanding that the baton is always balanced just a tiny bit off-center. There is something wonderfully off-balance, too, about ¬DiCamillo’s storytelling. It allows her characters to sparkle and soar. DiCamillo has called this novel, based partly on her own fatherless Florida childhood, "the absolutely true story of my heart." What a beautiful and generous heart it is. As in her previous award-winning books, DiCamillo once again shows that life’s underlying sadnesses can also be studded with hope and humor, and does it in a way so true that children will understand it in their bones. And that’s why she’s Kate the Great. DiCamillo's third-person narrative is written in simple words, few exceeding three syllables, yet somehow such modest prose carries the weight of deep meditations on life, death, the soul, friendship, and the meaning of life without ever seeming heavy, and there's even a miracle to boot. Readers will approach the tense and dramatic conclusion and realize how much each word matters. Raymie may not find answers to why the world exists or how the world works, but she can hold onto friends and begin to see more clearly the world as it is...Once again, DiCamillo demonstrates the power of simple words in a beautiful and wise tale. With extraordinary skill, two-time Newbery Medalist DiCamillo traces the girls’ growing trust in each other while using understated confessionals and subtly expressed yearnings to show how tragedies have affected each of them. The book culminates with a daring cat-rescue mission: fraught with adventure, danger, and a miracle or two, the escapade reveals how love and compassion can overcome even the highest hurdles. The girls don’t form an immediate bond, but their initial association of convenience eventually turns into a friendship of understanding and fierce loyalty. After christening the trio the Three Rancheros, Louisiana delivers these prescient words: “We’ll rescue each other.” And in a beautifully layered set of adventures, they do. The limited third-person narration gives Raymie her distinctive voice and spot-on pre-adolescent perspective of a young girl trying to make sense of the world around her. Here DiCamillo returns—triumphantly—to her Winn-Dixie roots. In short, precisely crafted chapters, DiCamillo once again demonstrates her ability to create unique characters that touch readers’ hearts. Raymie, in particular, is observant, thoughtful, and sensitive as she struggles to make sense of the world around her. Her story unfolds in uncomplicated prose, even as the themes explored are complex. Surrounded by the fully realized Louisiana and Beverly, not to mention the adults in her town, Raymie searches for meaning, a search that will resonate with readers. Poignant, insightful, and ultimately uplifting. From start to finish, Raymie feels her soul alternately shrinking and expanding like an indecisive balloon as she and her new entourage navigate the waters of friendship and heartbreak, love and loss, life and death. Most of the characters in this fine, funny, meticulously crafted novel live life "wishing for things that are gone," but there's certainly no chance that Raymie's lovely and large soul will ever completely shrivel with a "Phhhhtttt." Although this story is fictional, DiCamillo describes it as the true story of her heart...DiCamillo does a wonderful job of allowing readers into the depths of Raymie’s feelings and even into her soul. By the end of the book, readers feel like Raymie, Beverly, and Louisiana are true and lasting friends of their own. It is truly a heart-filled and heartfelt book. Fans will recognize DiCamillo's unique wry voice as it gives readers vivid images, dizzying ideas, humor, heart-wrenching emotions, and gorgeous, gorgeous language. You all have something to look forward to this April, I promise. DiCamillo writes with her usual easygoing delicacy; the portray- als of the girls are swift, telling, and gentle, with elliptical hints at Beverly’s and especially Louisiana’s homelife challenges (lack of money clearly limits Louisiana’s diet)...While DiCamillo fans will certainly enjoy reading this on their own, it’s also excellent classroom material, encouraging kids to stretch their decoding—and also to realize that even if you don’t get the outcome you want, it’s still possible to find closure. It’s an inspired choice, for surely this coming-of-age story is a fairy tale for our times. The young damsels in distress test their courage and rescue one another; and the book closes not with a conventional “happily ever after” but with a shared vision of the world as vast and yet intimately connected. DiCamillo, who has just ended her tenure as the National Ambassador for Young People’s Literature, understands that children can handle the tough stuff in fiction–after all, they have to handle problems like divorce, grief, abuse and poverty in real life. And a book like this can help. As Raymie’s neighbor told her before dying, “If you were in a hole that was deep enough and if it was daylight and you looked up at the sky from the very deep hole, you could see stars even though it was the middle of the day.” For children looking up from their own deep holes, the Three Rancheros could be those stars. Kate DiCamillo seems always to write with an understanding heart and a gentle archness of tone...As the summer progresses, the girls find poignant points of commonality and a surprising comradeship in this wistful, tender, funny novel for readers ages 10 and older. Raymie Nightingale is filled with humor, poignancy, and life-sized lessons. It is predictably unpredictable: a hallmark of DiCamillo’s brilliant writing. …though this book is awash in personal tragedies, it’s not a downer. It’s tightly written and full of droll lines and, yes I admit it. It’s meaningful. But the meaning you cull from this book is going to be different for every single reader. Whip smart and infinitely readable, this is DiCamillo at her best. "Raymie" is fast and fleet — a crystalline ode to childhood friendship that shines as brightly as anything that DiCamillo has written. DiCamillo...wryly captures the adventure and confusion of childhood with a gut-wrenching lack of sentimentality and a razor-sharp wit. Kate DiCamillo shines once again with her latest somewhat autobiographical children’s novel...Their adventures are fraught with conflict and humor, as they try to do good deeds, rescue animals, and even participate in some breaking and entering. Through their zany antics they realize some things are more important than winning a contest, and Raymie discovers happiness and friendship can exist despite unpleasant realities of life. Kate DiCamillo is the author whose books I anticipate with the most delight. I read them over and over. In simple but elegant prose, with grace and great humor, she writes truthfully about the human experience but always with hope. 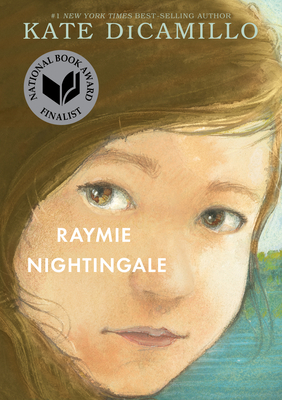 <i id="yui_3_16_0_1_1457716201642_7458">Raymie Nightingale is beautiful, a celebration of life, as are all her books. Newbery winner DiCamillo at her best. “Modest” and “tour de force” don’t usually go together, but they perfectly describe this quirky but melancholy coming-of-age novel. "Raymie Nightingale" is striking for its portrait of 10-year-old Raymie Clarke, who hopes to win the contest and push her father, who has abandoned the family, to come home. While Raymie Nightingale is written for a middle-grade audience, it is a moving novel that can be enjoyed by readers of all ages. It is an expertly layered and beautifully crafted story with not a wasted word or moment. The characters are living, breathing humans in whose struggles the reader becomes invested. And it’s a novel that shimmers with hope at its close, even if that absent father never actually pulls through. Readers will once again be treated with a novel that is rich and important on multiple levels by the exceptional writer Kate DiCamillo. Everyone should read Raymie Nightingale by Kate DiCamillo. It’s a classic tale of friendship, which we can all relate to. DiCamillo's original, loveable characters bring with them a hint of magic and an abundance of humanity and humor. Two-time Newbery Award-winning author Kate DiCamillo has crafted a unique and deeply appealing character in Raymie, and young readers will love watching her finally find a degree of peace.